I’m growing very tired of the rampant drone paranoia and I feel the need to debunk some drone myths. I hate to even use the word “drone,” because most people equate them with unmanned military aircraft which are used to spy on the enemy, or used as weapons. Most of us who fly what I prefer to call unmanned aerial vehicles (UAV’s), are not interested in spying on anyone. Many are hobbyists who love the challenge of building these vehicles and flying them. Others are professionals who use them for aerial imagery, mapping, thermography, real estate, fire prevention, search and rescue, or agriculture. I dove into this platform to shoot photos and videos of golf courses. Most people fear what they don’t understand, and drones are not well understood. The natural reaction to these devices is negative. One big paranoia is the “invasion of privacy” aspect. 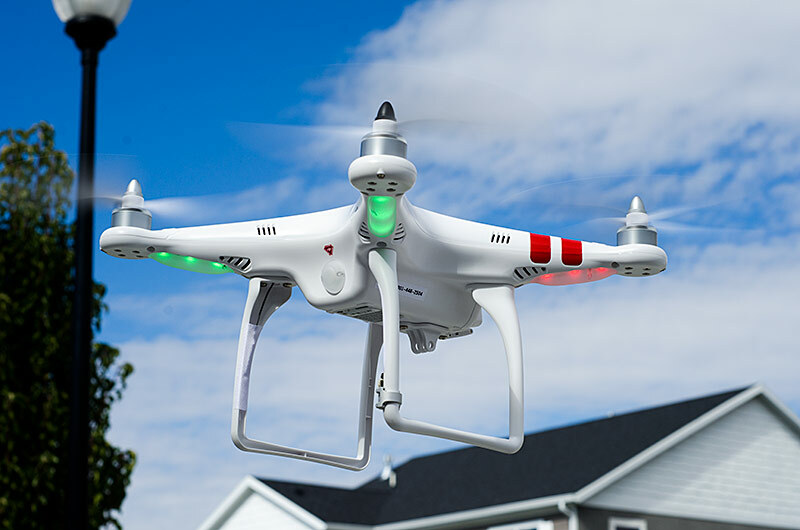 Sure, a “drone pilot” could fly an aircraft over the neighbor’s backyard or near the neighbor’s bedroom window and take photos or video. What most people do not realize about the cameras on most of these aircraft is that they’re equipped with very wide angle lenses. Think GoPro, a camera designed for action sports where the subject of the video is close to the camera, but the background is still in focus. In order to get a clear photo of someone in their backyard or their bedroom with such a camera, the aircraft would have to practically be up against the window. Even then the limited capabilities of the camera would make any photos or video extremely difficult to capture. Forget zoom lenses. Almost no camera equipped UAV’s have zoom lenses because of the weight and vibration. Weight means lower flight time and more tweaking to the craft to keep it balanced. Vibration of the aircraft is magnified with bigger zoom lenses, making it nearly impossible to get a clear photo or video with a zoom lens. I remember talking to a friend who hated drones. He said, “I hate those things. They’re an invasion of privacy. You could use that to see if I’m home.” This is such an uneducated statement. How could one tell if someone is home by taking a wide angle photo of the house? Take a look at the photo below and tell me which family is home and which one is at Disneyland. Who is home and who is not? Can you see the naked lady in her bedroom? There are better and less obtrusive ways of finding out if someone is home (so one could presumably rob them). First, one might KNOCK ON THE DOOR. If nobody answers, there’s probably nobody home! One could also check Facebook or social networks. Great posts like “the family just arrived for our vacation in the Bahamas” reads like “come rob us blind” to a crook with a computer. One might even use a telephone to call the residence. None of these three are-they-home solutions require buying a $1,500 remote control toy, plus $400 for a camera! Here’s a better solution for catching photos or video and invading someone’s privacy. How about using a telescope? How about a DSLR camera with a powerful zoom lens? Perhaps some binoculars? All of these allow the “spy” to be fairly far away, hidden from view. These craft are not quiet by any means. UAV’s can be as loud as a weed whacker or lawnmower. My hexacopter is almost as loud as a gas powered riding lawn mower, plus it is airborne so the sound travels even farther! Most of these small remote controlled aircraft are unstable in wind and can’t fly in bad weather. An unstable craft is not a great platform for a spy camera! It could be quite difficult to keep a UAV/drone airborne outside the neighbor lady’s window and in the perfect position to pick up any kind of photos or video with no wind at all. Mix in a small breeze and the “spy” would spend more time trying to line up the shot than his batteries would allow. See next list item. Most small aircraft like the drones we are talking about here have very limited ranges and limited flight time. These battery powered devices have flight times between 3-10 minutes on average, with a few able to make it 10-20 minutes. Both of my aircraft which have cameras on them range in flight time between 7 and 10 minutes. After that? I have to land and change batteries. Very efficient for spying! The range on most of these craft is very limited, and much of the control is via “line of sight,” meaning the flyer has to see the craft to guide it. Some are equipped with more sophisticated FPV (first person view) equipment, but that equipment has its limits as well. So if the drone is blocked by buildings or too far from the person controlling it, the signal will be lost and possibly the craft. Very few flyers have aircraft which are capable of longer range flights, and/or flights in which their radio signals can pass through or around buildings or over a few hundred feet. The best spy is the one who can do his job without the target realizing it. The best spy is one who is not seen or heard. The noise of the drone makes it heard as mentioned in #2 above. Due to the need for relative close proximity to the target, the drone will be VISIBLE. Many drones are equipped with lights to allow the user to know which direction the craft is flying and indicate remaining battery life, GPS lock, and other things. These lights make the drone even more visible, especially at night. 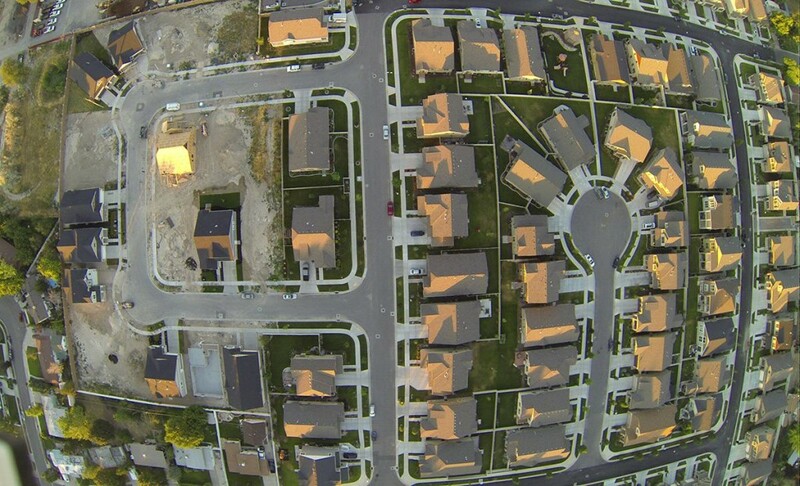 A neighbor saw me flying a small quadcopter (about 350mm wide) and was very irritated. She said to me, “that thing can steal phone conversations!” Despite my correcting her and telling her she should be more suspicious of her own government stealing her private conversations and information, she still believed my toy helicopter was recording her every word. Assuming I had the technology to spy on her, what is to gain for a person like me to spy on this lady? She’s not a supermodel bathing naked in her backyard. She’s not rich. She doesn’t have top secret information I could sell to foreign governments. I have no interest in her, her private matters, her private parts, or her phone conversations. Most who fly remote controlled aircraft would say the same. They’re not interested in spying on people. Pilots are interested in the challenge of building, maintaining, and flying these aircraft. Many also like capturing great photos and fantastic videos of scenic things like waterfalls, mountains, golf courses, lakes, boats, sports… I could go on. So IF a drone owner like me actually wanted to spy on a neighbor, which I do not, the cheapest spying drone setup is a $1,500-$2,000 loud craft which is hard to pilot (only in favorable weather) which would have to be right up against the window, or just a few feet from the target. It could only fly for 3-10 minutes before having to return for a battery change. Once the aircraft is in place and able to capture video/photos, the image is super-wide and doesn’t show much detail but for items within a few feet of the camera. Sounds like a reasonable spying solution. Can you see the new quad in this picture? 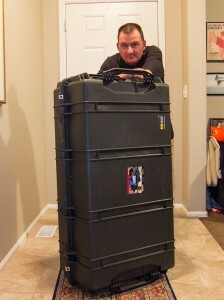 I’ve been shopping for a protective transport case for my large hexacopter for a while. The size of this bird, even when folded, is oversized for flying and requires a long and deep space. I looked at SKB hard cases and many others. Dual rifle cases were also on the table. As an early birthday surprise the lovely wife actually researched and bought me a Pelican 1780 Case with Foam (Black) . I had not considered Pelican as I figured a Pelican case of that size would be far too expensive. Somehow she managed to get a great deal which I found to be more than reasonable for a case like that. The 1780 is huge, heavy, and spacious. 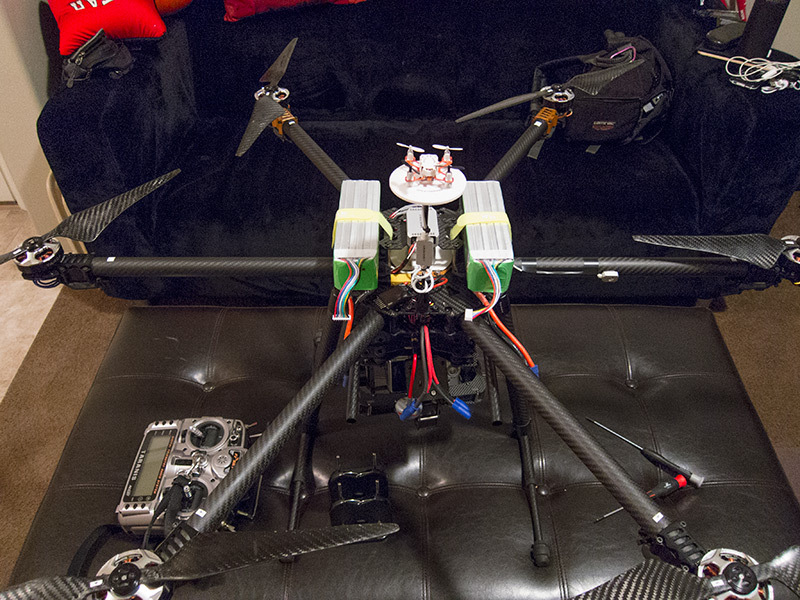 My hexacopter will fit, props off. The gimbal will also fit inside as will many accessories. I have yet to figure the layout, but that’s next on the slate. The one big drawback to this case is the size. If traveling with the hexacopter, this oversized case will cost as much as $200 EACH WAY to check. I suppose that is just the way it has to be with a bird of this size.